Yesterday I bought 2 bulbs of soft-neck garlic at the supermarket. I came home and planted them even though there was 2 inches of snow on the garden. I just pushed the cloves into the mud. We will see how they do. I have been wanting to try some hardneck, but can't find any. just plant and mulch and youll have garlic before you know it! i planted another 100 two days ago and got another 175 to plant today. Just out of curiousity, what is the diference between soft and hard neck garlic ? You got me doing it, too. Went out and planted several handfuls of garlic cloves and Egyption onion topsets around and between my espalier fruit trees, under the leaf mulch. From growing some of both last year, the difference is pretty obvious. Soft neck stem is soft, hard neck stem is hard, after curing. The only importance of the difference, that I know, is that the soft necks tend to store longer than hard necks do. Soft neck garlic is the type most often found in supermarkets. The leaves are supple and can be braided. I am sure you have probably seen braids of garlic before? On the hardneck, there is a stem (scape) that comes up from the circle of cloves and it is actually stiff and hard. No braiding these. 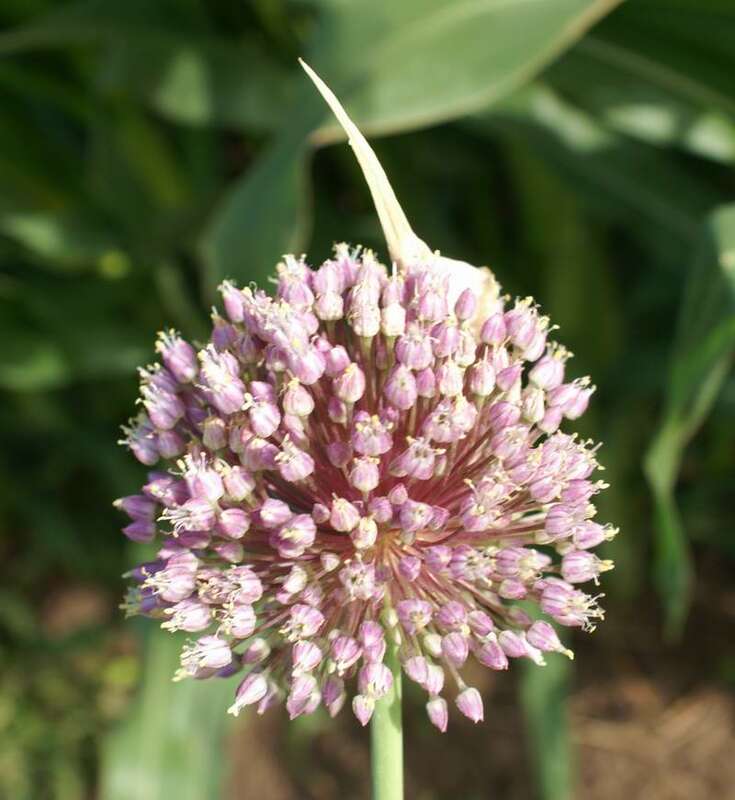 On the top of this neck or scape a number of bulbils form and you can plant these to propagate the garlic. Some say this type is most flavorful. I have been planting a variety of elephant garlic for years. I planted a bunch of that over a month ago. The roots and leaves begin to grow through winter under the snow, and in the spring it will be up when the snow melts. These are nice just for show. 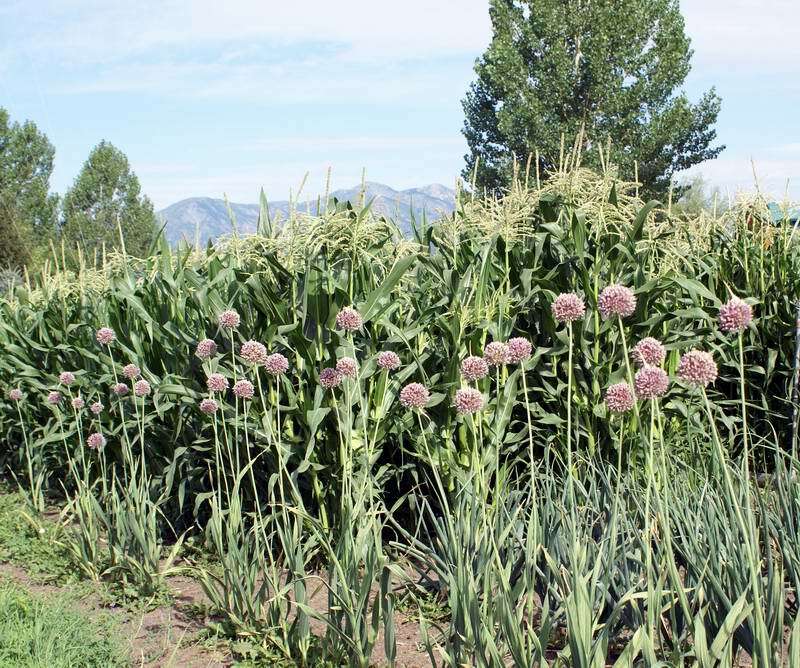 Here is another pic of elephant garlic in bloom. Snow gardening I like it. I planted garlic a few weeks ago and am hoping for the best. Aren't you suppose to cut the scapes off to help the bulb form? I tried that on half of my elephant garlic this year. The conclusion was: It didn't help any. The only thing it seemed to change is, the ones I trimmed dried up sooner. I could not see any significant difference in the size of the bulbs. So, from now on, I will just let them bloom. They are pretty. The bees like them. What's not to like? Elephant garlic is not a true garlic, though culture, harvest, storing, and use are all similar. Here is what thegarlicstore.com says about cutting the scapes. "Incidentally, many people wonder if the scapes should be cut in order to increase bulb size? For elephants the answer is definitely yes. For hardnecks, yes appears to be the correct answer also, although some varieties seem less affected by leaving the scape attached. Cut them generally just before the scape has fully extended (or the coils in the Rocamboles have started uncurling). When still young, the scapes are considered good eating by some." Here is what wikipedia says about the very mild flavored elephant 'garlic'. Hardneck garlics tend to have a more or less a single row of very large cloves around the inner stem so you do not have to mess around with peeling all those little bitty inner cloves. They don't store as long as some of the soft necks, but I tend to gorge on roasted garlic from the garden so it is mostly gone in a few months any way, and I can dry the rest for cooking. They come in many different flavors/intensities, as do the specialty softnecks. Grocery store garlic is pretty cheap so it is probably more worthwile to grow specialty garlics with flavors you really like than to try to grow a years worth of long keeping garlic. I also question the ability of home gardeners to store vegetables as long as commercial sources. It is just too difficult to reproduce the right conditions. You can get alot of interesting information by looking up sites that sell garlic. They will probably all be sold out by now but the imoprmation is still there. There are also a couple of interesting articles posted on Dave's Garden. I think one is titled something like "growing hardneck garlic in northern areas." Wikipedia also has a good article on garlic. You do not have to rush to plant garlic before it freezes this time of year because it is so late. If you get it in as soon as the ground thaws in early spring you will be OK. You either want to get it planted early enough in the fall to allow some root growth before freezing so frost heaving doesn't push it out of the ground, or get the garlic in the ground asap after thawing so that the plant can grow large while it is still cold. Warm weather causes maturation without good clove formation. Around here the garden centers don't stock planting garlic until late winter/early spring. I hope my garlic comes up and is at least half way decent. It is form the grocery store. Have no idea if its this or that. You've all got me thinking about planting garlic. I've never tried garlic before, but recently my niece told me she and her husband eat pickled garlic, of all things. I've got a bunch left over from canning. They've been in the fridge, though, for about a month. If the ground is soft enough to turn, could I just shove these into a bed? If so, how deep do you plant them? Is is pointy side or rounded side up? How far apart? I think they would be really pretty in my teeny tiny front bed, which is roughly 3.5' by 6.5'. Is it too late? Should I just chuck these old ones and wait for spring?